Music Out Loud is a project that posthumously honors musicians who have significantly contributed to music growth in the area or made a name for Olympia, through artistic design and music performances in downtown Olympia. 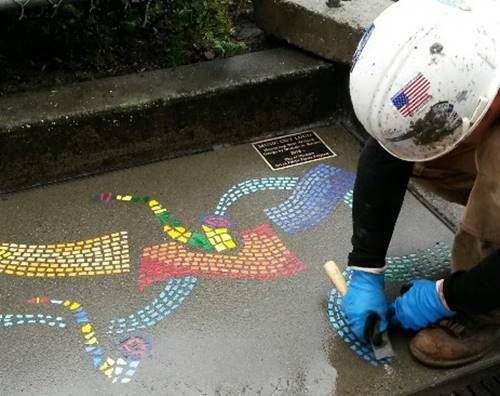 The first part of the project, three mosaics in downtown Olympia sidewalks, was recently completed. Designs by three local artists were fabricated and installed by Belarde Company, using a special process called LithoMosaic, which sets the mosaics directly into concrete. The artworks will be dedicated during Arts Walk with a walking tour on Saturday, April 28, from 12:00 – 2:00 p.m. in downtown Olympia. The tour will begin at 4th Ave. and Chestnut St., and will continue to 5th Ave. and Capitol Way. The second part of the project involves live music. Each of these locations will become a living testament to music in our community, with 9 total acoustic music performances to be scheduled over the summer, in partnership with the Olympia Downtown Alliance. Lived for 10+ years in Olympia and had a significant connection with the Olympia area. 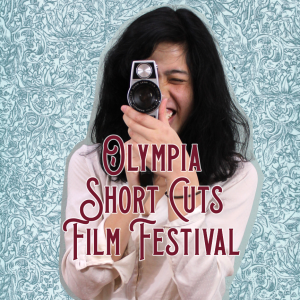 Contributed to the vitality of Olympia’s music scene. Honored by local musicians and aficionados for his/her contribution to the community. With his or her passing, left a lasting legacy that will forever be remembered. 14 submissions were received. After deliberation by the Arts Commission and approval by City Council, 3 musicians moved forward in the process: Verne Eke, Steve Munger, and Bert Wilson. Through a separately held public art process, these legacy musicians were matched with artists Nathan Barnes, Michele A. Burton and Jennifer Kuhns. Saxophone player for 30 years, well known and highly regarded among jazz musicians, but also played rock, blues, funk & reggae. A consummate musician at the center of the Olympia music scene since the early 80s. He was the kind of musician that everybody wanted on their recordings because he made everyone around him sound better. Bands he played and recorded with include Harmonic Tremors, Sweatband, Neobop, the Artesian Art Ensemble, Barbara Donald & Unity, Bert Wilson ensemble, various Steve Munger ensembles, Jam Camp, and Sour Owl. Anyone who knew him remembers Steve for his maniacal laugh and generous spirit as well as for his amazing musical skills. Brilliant musician and singer, talented orchestra leader and music scholar. Produced and conducted operas and musicals, and co-founded the original Harlequin Productions, where he was music director for over a dozen shows. Founded The Capital Area Association for the Performing Arts (CAPPA) and was pivotal in acquiring the legislation and funds that allowed the building of the Washington Center for the Performing Arts. World renowned saxophonist and composer with a 7 octave range and over 200 songs to his name. Teacher for many world famous saxophonists to include Lenny Picket of Tower of Power and musical director of NBC’s Saturday Night Live, Jeff Coffin of the Dave Mathews Band and Ernie Watts of the NBC orchestra. Stricken by Polio when he was very young and was confined to a wheel chair his entire life. In spite of his disability, he created a concept on saxophone that placed him among the greats of the instrument. Influence on the local music scene was profound. Some of the legends of Jazz would stop by Bert’s home to play and visit with him. Many musicians moved to Olympia to play with and learn from Bert. His group Rebirth, which was filled with Olympia musicians, had international acclaim for its recordings and performances. His music continues to be heard in local venues.